Now in its 15th year, Edinburgh Whisky Fringe has established a reputation as one of the must-see attractions in the annual whisky calendar. For those lucky enough to get their hands on a ticket, there were more than 250 whiskies to sample – not to mention the ‘half-time orange’ treat drams, of course. Tom Bruce-Gardyne reports. Well, suffice to say, Royal Mile Whiskies has been living the dream for some time. Its hugely popular Whisky Fringe has just celebrated its 15th year, and most of them have been held here. Forget any citrus-tinged memories of shivering on the school playing fields, the ‘orange’ is a real treat, and works like this: each stand is invited to pick a particularly special bottle, the name of which is displayed on a board. At 4pm a whistle signals that pouring can commence. 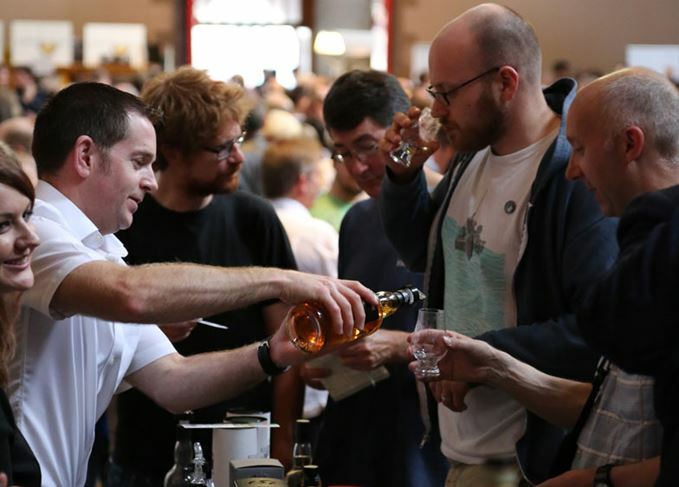 The idea behind it is to resolve a perennial problem of whisky festivals, whereby the most sought-after bottles are necked by those with the sharpest elbows within minutes of the start. That said, on the Friday I was there, knowing you could only pick one was torture. Studying the board, I was plunged into an ecstasy of dithering… do I go for a Dalmore Quintessence? A single cask Springbank 21-year-old? An Ardbeg Dark Cove? In the end I chose a ripe, delicately spicy Linkwood 1998 Côte Rôtie from Gordon & MacPhail. ‘I’ve tasted some absolutely memorable “half-time oranges”,’ Meikle continues. ‘Whiskies I know I would never normally get to try.’ As we watch people besiege the stands at 4pm, I ask what sort of folk come to Whisky Fringe. ‘From last year there seems to be a big increase in couples, instead of groups of just boys or girls,’ she says. ‘It’s educated, it’s informative, it’s friendly and you’ve got the guys from Royal Mile looking out for people who may have got a wee bit over-excited.’ Apparently she has been proposed to three times. Back down the nave from where the altar once stood, Tony Reeman-Clark had a moment of pure epiphany at Whisky Fringe, as he explains: ‘I had come along with a couple of friends and we were standing right in the middle when someone said: “Wouldn’t it be nice to have one’s own distillery?”.’ And at that moment a sunbeam suddenly burst through the stained glass window and bathed them in celestial light. It was an idea that grew legs over a few post-show beers that evening, and refused to die the morning after. Six years later to the day, he is back at the fringe as an exhibitor for the first time with the Strathearn distillery from Perthshire. It claims to be ‘probably Scotland’s smallest distillery’ and with two stills each the size of an over-inflated Space Hopper, it’s probably true – anything smaller and we’d be talking moonshine. Yet its stand is the same size as everyone else's, even if it produces in a year what Diageo distils in minutes. On which note – where is Diageo at this year’s Fringe? No one seems to know. Strathearn is preparing to bottle its first whisky having waited the statutory three years since the stills were fired up in 2013. Next week, on 23 August, the whisky guru Charles MacLean will begin a three-month auction of 100 bottles, with the first one delivered personally ‘so long as it’s to somewhere warm’. As I’m hearing this, my eye is caught by a deep amber bottle of John Paul ‘Bold’ on the neighbouring stand of Gordon & MacPhail. It’s my first taste of a peated Indian single malt and I am not sure if its tropical, banana-like fruit is real, or just imagined. But its smoky element is undeniably Scottish, with the peat shipped all the way from Islay to Goa. There’s nothing smoky about the Glengoyne poured at the other end of the room, though. ‘It doesn’t pretend to be anything other than a classic Highland malt that’s unpeated, slowly distilled and predominantly Sherry-matured,’ says Ian Macleod’s Alan Wardrop. It was certainly going down a treat with punters who, in the past, might have stampeded en masse to the hairiest peat-soaked dram on offer. Among so many weird and wonderful whiskies, I should mention The Glover, a fascinating fusion of Japanese and Scotch malt whisky created by Adelphi, whose Alex Bruce is struck by people’s level of knowledge. Compared to other festivals, he reckons the Fringe ‘probably has the highest proportion of educated whisky drinkers’, and claims to have ‘only ever seen two casualties in all the years I’ve been coming’. Maybe people behave better in church. Tickets for the 2016 Edinburgh Whisky Fringe cost £30 (including a £10 token towards a bottle). Next year’s release date will be in early May.